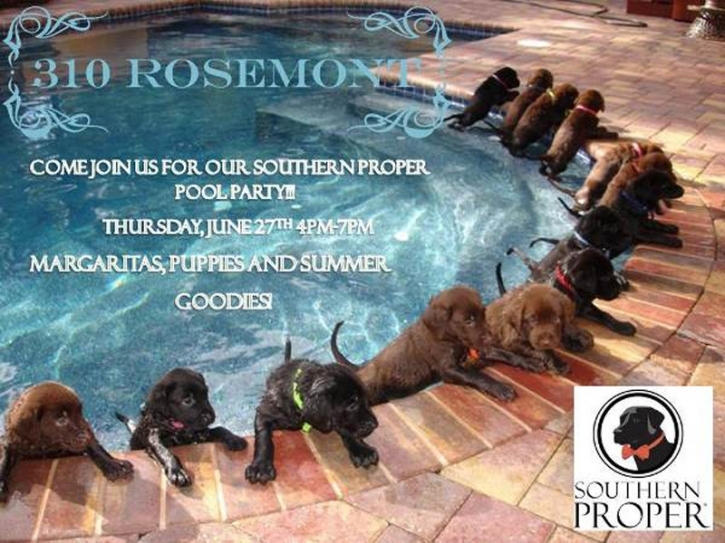 Last night we got to hang out with the crew of 310 Rosemont at the Southern Proper Pool Party! 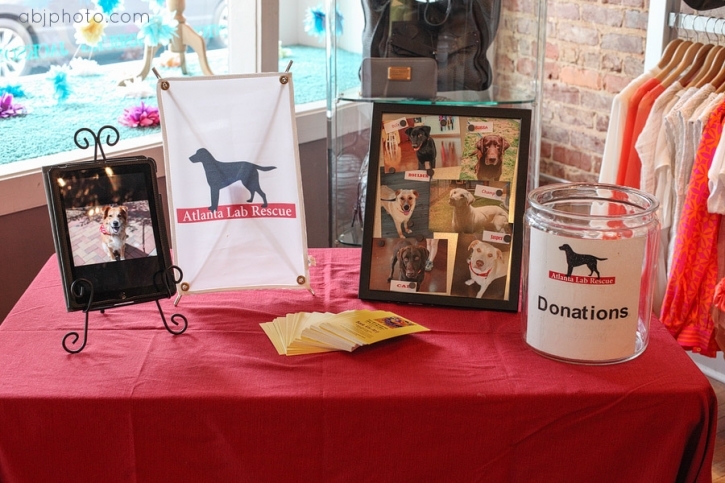 It was a fun event showcasing Southern Proper summer goodies, and we were there handing out info about our upcoming Atlanta Lab Rescue Event – Bark for Art! Of course I had my camera in tow and some ALR fliers. As a huge fan of black labs I had so much fun watching the new face of Southern Proper, River, bound around the shop like only sweet little pups can! I was also SO EXCITED to meet the famous shop dogs at 310 Rosemont, I have heard so many fun stories about them, it was a treat to spend the night with them! Our Atlanta Lab Rescue table! 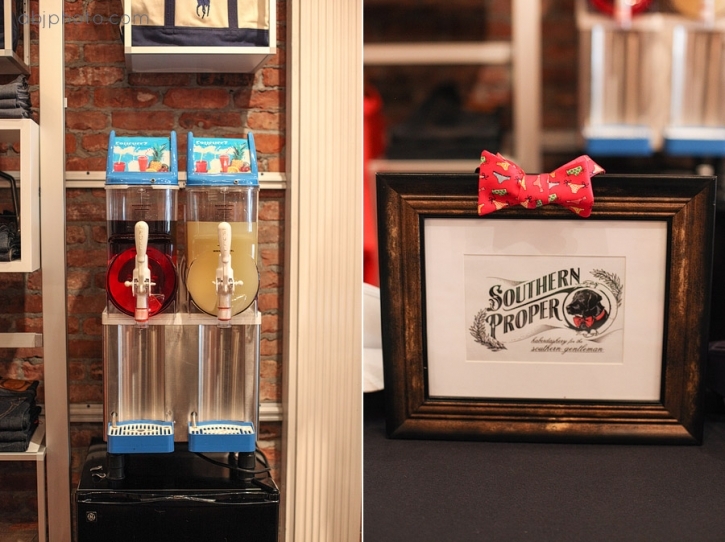 Drinks, Southern Proper goodies, and snacks were a hit! To find more about tickets to our Bark for Art event visit the site today! Meet CHANEL and HANK! They are the sweet shop dogs at 310 Rosemont, and dear to our Atlanta Lab Rescue hearts! These two were decked out in their pool party gear, and showing off some pretty cool tricks throughout the night! River knows how to have a good time! He is a very playful puppy and had LOTS of attention last night. But, how neat to be able to socialize your puppy and truly teach him about southern charm? Thank you to the amazing manager at 310 Rosemont, Jessica, for having us and for being such a wonderful hostess! Thank you Jane for this photo! I never make an appearance on the blog! Hank knows how to Paaar-tay! So much fun with the ALR crew!!! That’s a wrap on such a fun night! Please check out our Bark for Art page, and get yourself over to 310 Rosemont to dress your man in Southern Proper and find the perfect complimentary dress! For more information on booking your portrait session click on the CONECT button above! Thanks y’all! And, have a great weekend!